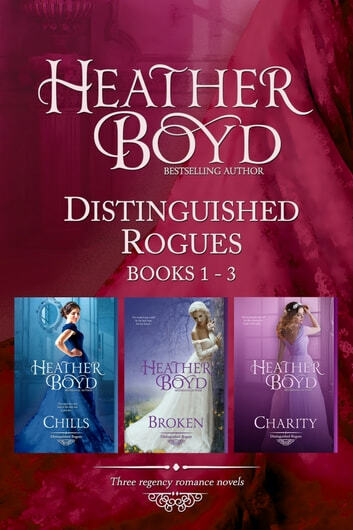 Introducing the Distinguished Rogues—wickedly irresistible lords and the enchanting ladies of the ton who capture their hearts. 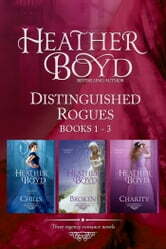 Bestselling regency romance author, Heather Boyd, brings readers the first three novels in this series in this special edition boxed set. Broken (Book 2): Unrepentant rogue Giles Wexham, Earl of Daventry, is dedicated to avoiding needy women, and marriage. During his summer retreat, he becomes reluctant nursemaid to Lillian Winter, his former betrothed. Shy, fragile Lilly tempts him but to claim her Giles must expose the dangers her past—before it’s too late. Charity (Book 3): Darling of the ton Oscar, Lord Carrington, has thoroughly lost his way but knows what he needs to be happy. However, righting past wrongs isn’t easy and he’ll have to risk scandal to make everything right again for the woman he loved and lost. Enjoyable reading good romances with a bit of a twist in the storyline, I am glad I purchased the three novels together so I did not have to chase them up. Amazing stories couldn't put it down!